Playing basketball at Aix-en-Provence this season has been a challenge with just seven professional players. Yet this weekend they ended up being the big winners of round 21. At the other end of the table Arras and Hainaut Basket were the big losers. So who will be playing basketball in LF2 next season? 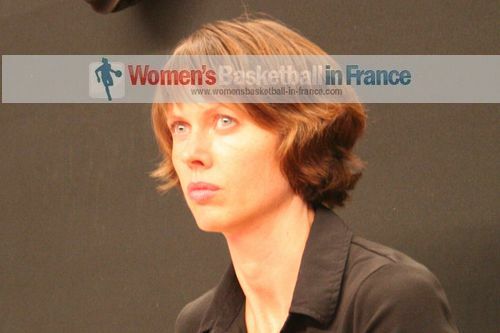 Last week Aix-en-Provence added Sandra Ygueravide to their roster, primarily as a medical cover for Shona Thorburn. While Ygueravide (20 points and 8 assists) made her début in the victory against Toulouse (91-90) in double overtime, Kelly Corre was absent. Toulouse, playing home, should wonder how they lost this game in which the lead changed hands 29 times and was tied on 13 occasions. The hosts held all the aces with a fully rotational roster of eight players and by leading for more than 38 minutes. Aix-en-Provence on the other hand led for just six minutes and had six players clocking up at least 34 minutes. Cayla Francis (in picture) led the way with 26 points and 11 rebounds. Marianna Tolo (10 rebounds) and Lizzie Murphy (14 rebounds) also compiled double-doubles by scoring 21 and 13 points respectively. For Toulouse five player finished in double digits. Chalysa Shegog was by far the most efficient hitting 9-from-11 shots from the floor in her 23-point total. While Aix-en-Provence are one of the big winners of this round, Toulouse still hold the aggregate score victory over the two games. However neither team is safe from relegation. Tarbes are playing basketball with urgency these days and won their fifth straight LFB game (97-77) against Arras. In addition they had to play this match without their head coach Cyril Sicsic who was suspended for one match (with three technical fouls this season). Lina Brazdeïkyte (in picture) was in charge for the day. After a tight first quarter (21-20) she got her players into the grove by half time (51-37). The contest was over by the end of the third quarter (83-56). 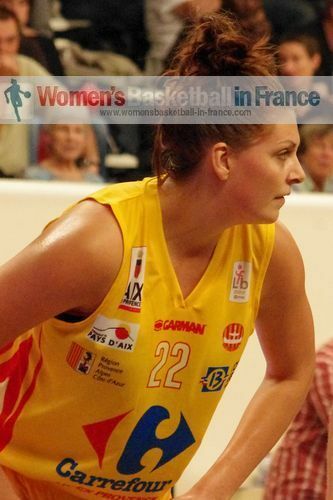 For Tarbes Kristen McCarthy and Paoline Salagnac were the big scorers with 24 and 23 points each. Pauline Akonga-Nsimbo had 25 points for Arras. The game got a little heated during the third quarter and almost erupted after a clash between Salagnac and Dawn Evans. With Hainaut Basket losing to Nantes-Rezé (55-60) this weekend, they join Arras as the big losers of the weekend. Neither team can qualify for the LFB championship round. Perpignan Basket blew away Charleville-Mézières in the first ten minutes (21-9). Despite the efforts of Amel Bouderra (16 points) they paced themselves to victory (73-59). Héléna Ciak (in picture) led her team with 15 points. Yet all 11 players got on the score sheet. Although Lattes Montpellier were withouth Fatimatou Sacko and Géraldine Robert (who was suspended) they had a great game. They played with fire to win (66-61) against Lyon BF. For Lyon Mame-Marie Sy-Diop was out injured while Mistie Mims was not at 100%. 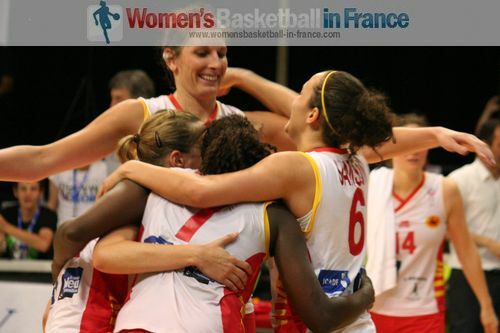 Still Mims scored 18 points in 21 minutes while her team-mate Romy Bär led Lyon with 20 points. However it is March and it was the American - playing basketball for Montpellier - Kristen Mann who had the last laugh with 18 points. With this victory Lattes Montpellier are one victory away from booking their place in the LFB Championship round. Bourges Basket are on a roll. Basket Landes were no match and consequently lost (58-70). Jo Leedham is still out for Bourges but all the other nine players played at least 17 minutes and scored. Styliani Kaltsidou was the team's leading scorer with 11 points. For Basket Landes Carmen Guzman was the game leading scorer with 22 points. Jennifer Humphrey and Olivia Epoupa had 13 and 12 points each. Things are not going well for USO Mondeville and despite home court advantage they were no match for Olayinka Sanni and Villeneuve d'Ascq (71-79). Sanni had 28 points and was fouled 8 times. Villeneuve are one of the winners of this weekend as they move out of the relegation battle into the fight for a place in the Challenge round.